50-PINT CAPACITY For room sizes up to 2,900 sq. ft.
ELECTRONIC CONTROLS WITH DIGITAL DISPLAY With soft-touch controls and large LCD display, the functions are easy to set and read. The electronic humidistat and fan speed functions allow you to easily set your desired level of comfort. PATENTED HEAVY-DUTY PUMP SYSTEM v NEVER EMPTY A BUCKET Patented pump system automatically removes moisture from collection tank. Just attach the 16-foot hose (included), and the unit can even be drained upward through a window. 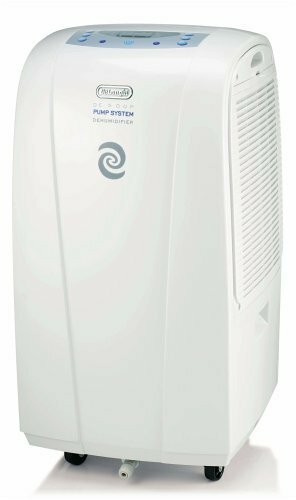 Dehumidifier function can be operated with or without pump. IDEAL FOR BASEMENT USE v LOW TEMPERATURE OPERATION Designed to function at temperatures as low as 44+F. 24-HOUR PROGRAMMABLE TIMER Electronic timer allows you to easily program the start/stop delay function. LATERAL INTAKE / OUTTAKE GRILLE Unique lateral grille design provides several options for positioning the unit, including directly against the wall. TANK CONTROL SYSTEM Our special safety system prevents water overflow due to a full, improperly positioned or missing tank...or even if the optional connector hose is obstructed. THREE OPERATION MODES The unit features two functions, a fan only control with three speeds and dehumidification. AIR FILTRATION TECHNOLOGY Permanent, washable air filter traps bothersome dust particles and extends the life of the unit. 16-FOOT & 3-FOOT DRAINAGE HOSES INCLUDED No assembly or plumbing necessary. PERFECT FOR ANY ROOM Ideal for use in the basement, living room, bedroom, office or wherever excess humidity is present.